I get all sorts of anxious when people pop-in without warning–or when I have no time to prepare, which seems like every time I entertain. Corners must be cut. Time must be found elsewhere. One of my favorite ways to make a last-minute short-cut is in my desserts. 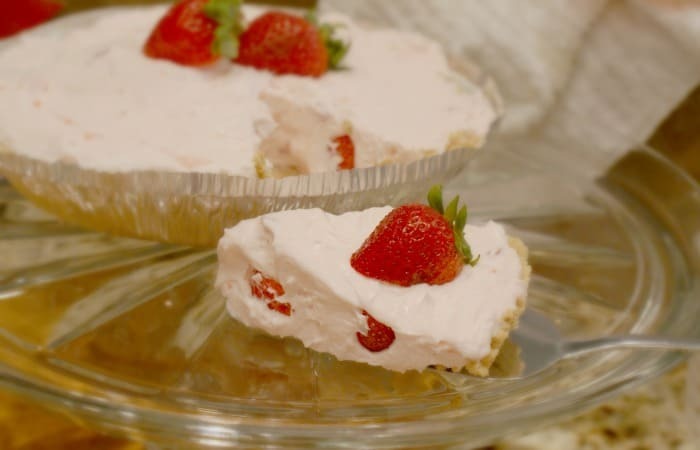 Fantastic things can happen in ten minutes, specifically yummy things like this Strawberry Cheesecake Pie. Light, fluffy, filled with strawberries (which are the awesomest of summer fruits), this is one of the best recipes on the planet (thank you, mom). 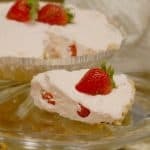 Because this is another fresh-strawberry recipe, don’t make this more than just a few hours before you plan to consume like a crazy-beast, since the strawberries will just release their juices as it sits, so the next day, it might be soggy. I don’t really know, since I only eat this pie within about an hour of making it. I don’t ever let it sit for long. You can also pop the pie in the fridge, if you want it to firm-up a little more, but that’s really unnecessary. This is honestly a make-and-eat-pie in 10 minutes. In a large bowl, using a hand mixer, cream the cream cheese. In a separate bowl, using a wire whisk, combine the milk and pudding mix. Mix the pudding mixture and the cream cheese, using the hand mixer. Add-in the cool whip and mix well, until everything is a pretty, creamy pink. You can lick the mixer paddles now, but you should probably unplug the mixer before sticking your tongue in. Using a spoon, fold-in the strawberries, being careful to keep them intact because they’re yummier that way. Spoon the pie filling into the crust and shape prettily. Place your garnishing strawberries on top and dig in! 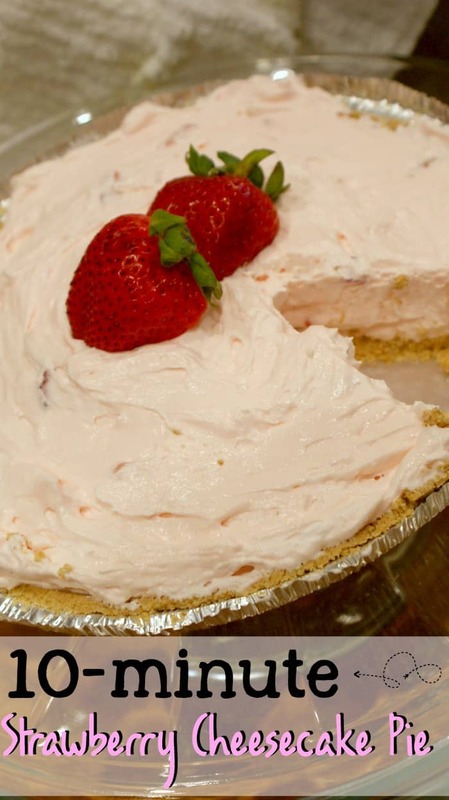 Fantastic things can happen in ten minutes, specifically yummy things like this Strawberry Cheesecake Pie. Light, fluffy, filled with strawberries (which are the awesomest of summer fruits), this is one of the best recipes on the planet (thank you, mom).